Nanoplasmonic sensing is an optical technique that enables robust label-free detection of biomolecular interactions in real-time. 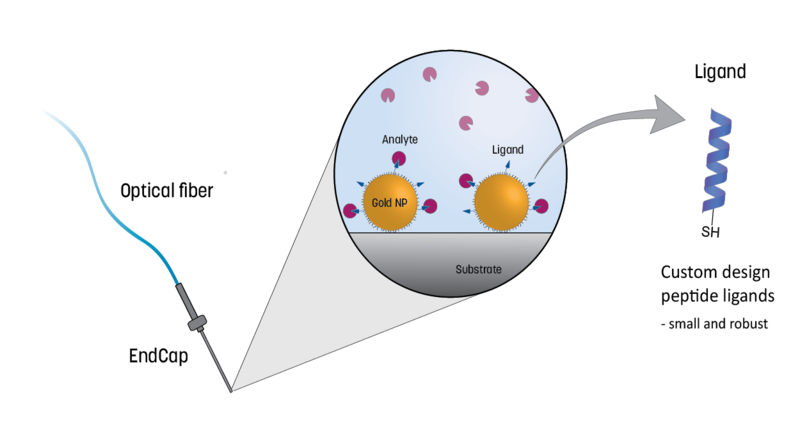 The transduction mechanism exploits a phenomenon known as localized surface plasmon resonance (LSPR) that occurs in metal nanostructures, such as gold nanoparticles, where light of a particular frequency can induce collective oscillations of electrons at the nanoparticle surface. The LSPR frequency is highly dependent on the local dielectric environment in the close vicinity of the nanoparticles. Small changes in the refractive index caused by binding of biomolecules to receptors immobilized on the metal surface alter the LSPR frequency which can be detected spectrophotometrically. LSPR has been extensively used in benchtop biosensors for laboratory use. By combining nanoplasmonic sensing with fiber optics, we have developed a miniaturized sensing system that basically shrinks a benchtop biosensor to the tip of an optical fiber. The gold nanoparticles that generates the signal are integrated in a replaceable sensor chip that is connected to the tip of an optical fiber and which guides the optical signal from the light source to a detector. The novel design of the ArgusEye technology ensures a high signal-to-noise ratio of the optical response and a unique sensor performance. Still, the overall diameter of the sensing probe can be as small as 1 mm. For online biodetection and flexible system integration we have developed a multichannel flow system the enables simultaneous detection of multiple analytes. Refractometric sensing using metal nanoparticles is a highly generic technique where specificity is attained by attaching capturing molecules (ligands) to the surface of the nanoparticles (See figure below). The sensor system can thus be addressed towards various (bio)molecular analytes by using the appropriate ligands. Custom designed peptide binders towards various analytes are currently being developed and tested. The ArgusEye technology is also compatible with commercially available ligands, including Affibodies, aptamters and antibodies.